There hasn’t been a lot of baking around my house since Epiphany (just lots of chocolate-making for my business, which doesn’t count), except for one absolutely brilliant batch of muffins. For those of you who are regulars here, you probably remember the preserves from Deerview Fine Foods that I reviewed during the “Twelve Gifts of Christmas.” Deerview’s contribution to my prize hamper had included two jars of marmalade, a plain Seville orange one (which vanished within two weeks of opening) and a whisky marmalade, something that I had not even known existed. The marmalade was certainly delicious, but, finding the flavour a bit too strong for my taste to simply spread it over toast, I decided to bake something with it. When we were kids, my mum used to make us muffins every week, usually with fresh blueberries or raspberries, but often in the winter she would use a fruit jam instead. It struck me that I could make a marmalade version of the muffins, and since the preserve is sweet already, I wouldn’t have to add any additional sugar! 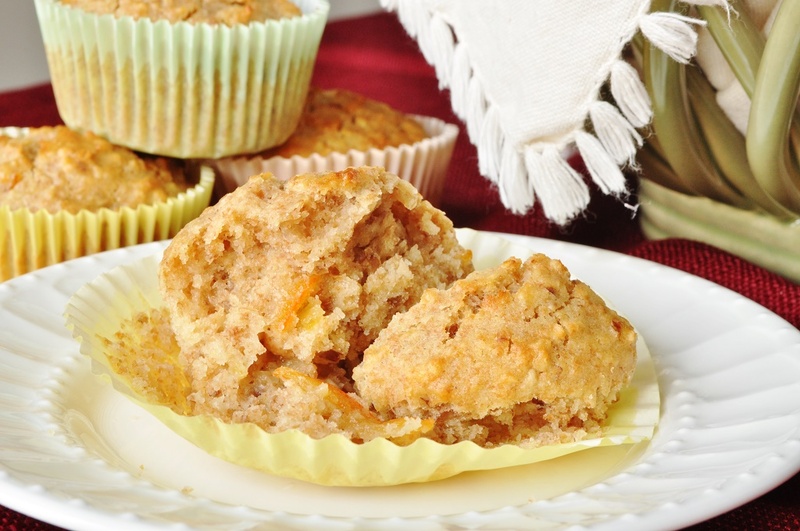 Although honestly, these muffins are so packed with healthy ingredients—oats, wholemeal spelt flour, pecans, yogurt—that a few tablespoons of sugar would probably be excusable. 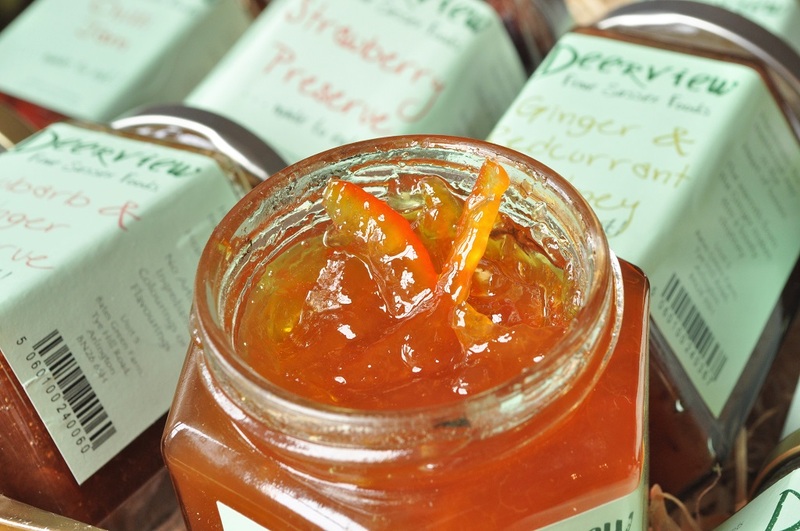 However, with luscious marmalade to sweeten them, you don’t need any sugar at all. 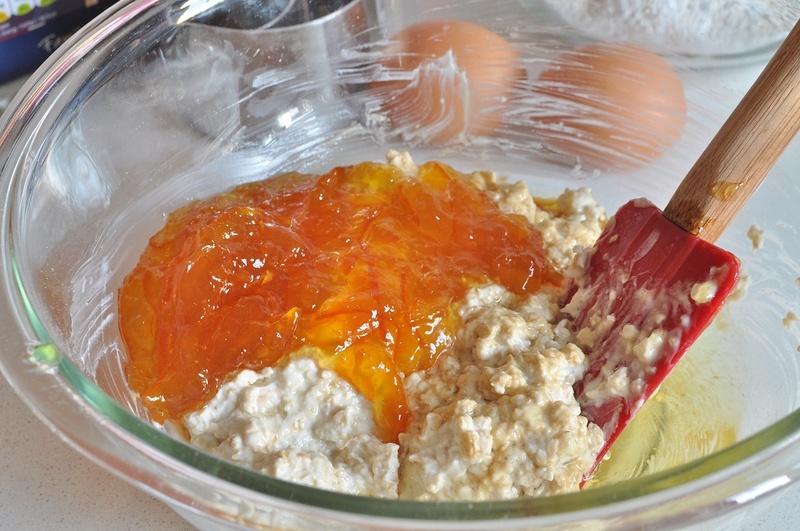 The marmalade also imparts the loveliest orange flavour, which melds gorgeously with the oats and pecans. They are so scrumptious that I didn’t even mind skipping my usual weekend batch of cookies. 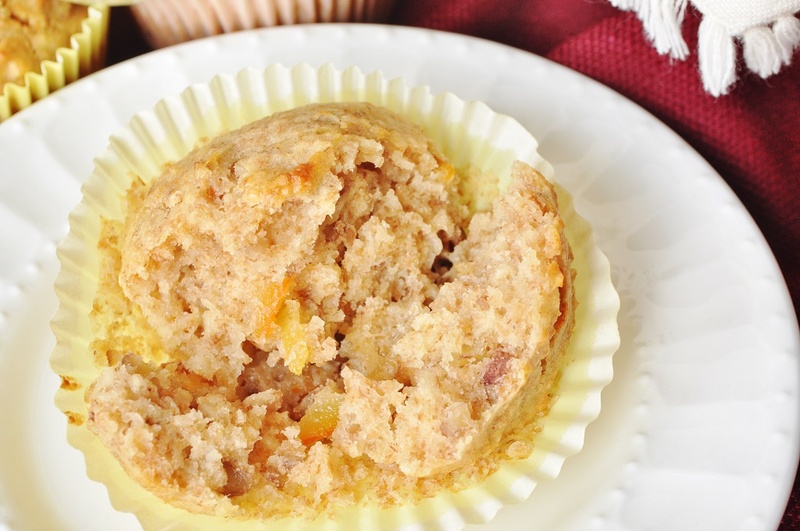 I particularly recommend these muffins for kids’ lunch boxes, just as my mother used to bake her version for me and my siblings in our grade school days. I am sharing these muffins with Tea Time Treats, where the theme is packed lunches. 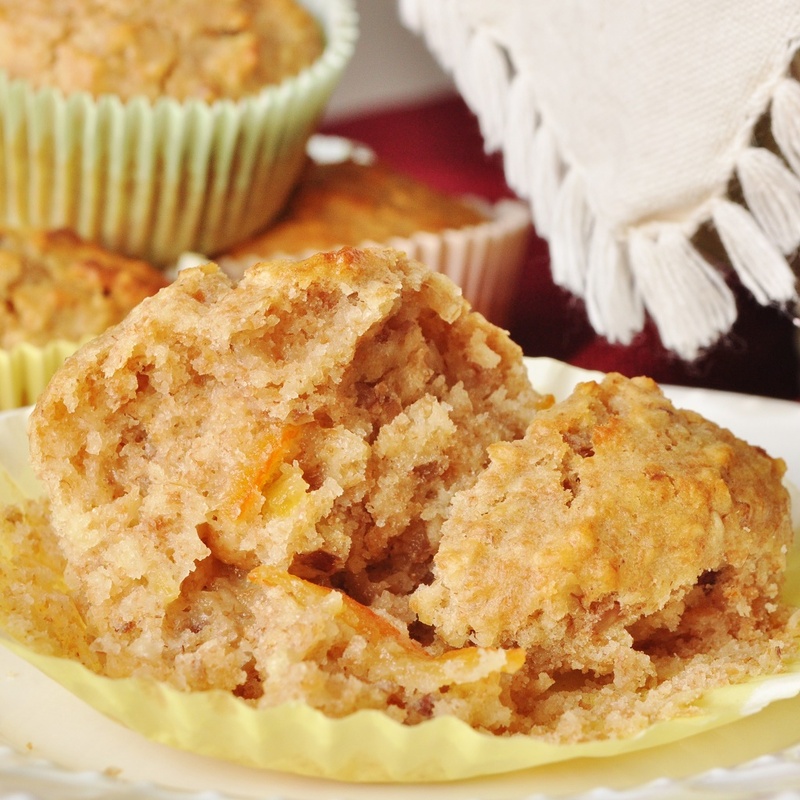 I can’t imagine a healthier or more delicious treat to tuck into a lunchbox than these muffins! 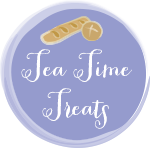 Tea Time Treats is co-hosted by Karen of Lavender and Lovage and Janie of The Hedgecombers; this month is Janie’s turn to host. It might be stretching things a bit, but as I used whisky marmalade, I am submitting the muffins to Cake of the Week’s Baking with Spirit as well. The theme was healthy, so the muffins definitely qualify for that part of the challenge! Preheat the oven to 200°C/400°F. Line a standard 12-cup muffin tin with paper lines. In a large bowl, combine the oats and yogurt. 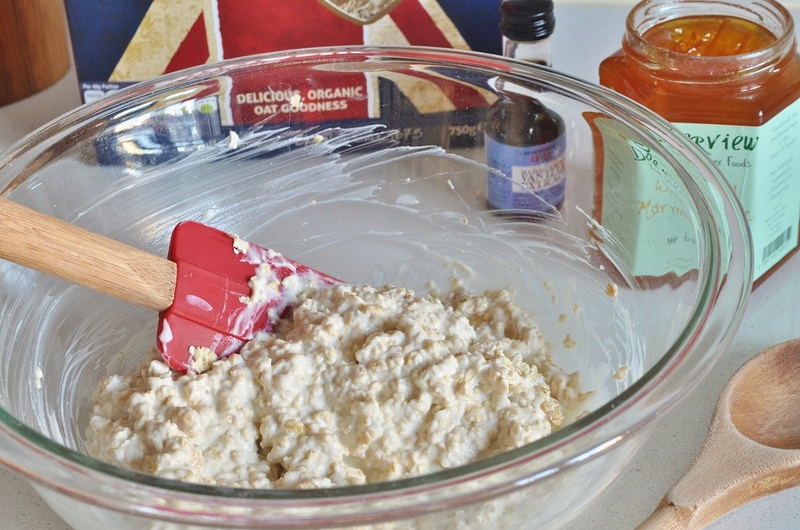 Let stand five or ten minutes to soften the oats. Meanwhile, in another smaller bowl, whisk together the flour, baking powder, and ginger. 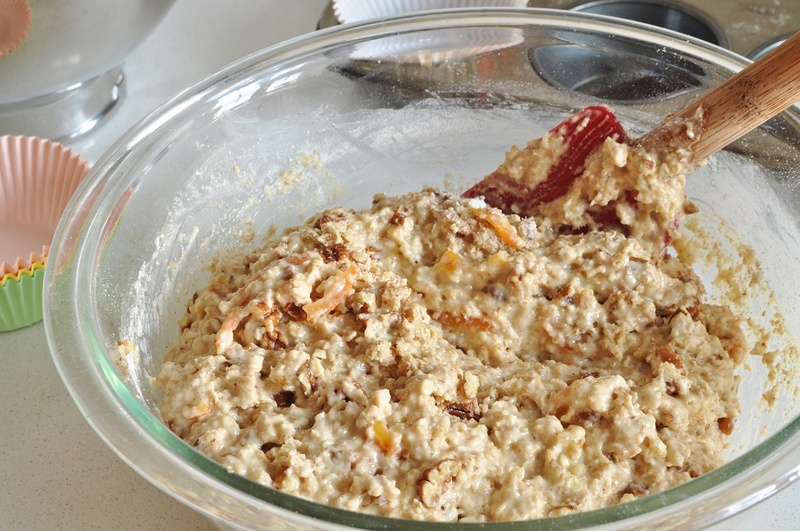 Beat the oil, vanilla, and marmalade into the oat mixture, and then lightly stir in the dry ingredients and pecans. You don’t want to mix it very thoroughly, as minimal stirring is a key to tender muffins; there should still be clumps of flour in the batter. They will be worked out when you fold in the egg whites during the next step. Set the muffin batter aside briefly while you whip the egg whites to soft peaks. You can do this by hand or in a stand mixer fitted with a whisk attachment. Fold the whipped whites gently into the muffin batter, just until no white streaks remain. Using a ¼ cup measure or similarly-sized cookie scoop, portion the batter into the lined muffin cups. Transfer to the oven and bake until a toothpick inserted in the centre of a muffin comes out clean, about 20 minutes. Remove the muffins from the pan and place them on a wire rack to cool. The muffins will keep for two days on the counter in an airtight container; after that, I suggest popping them in the freezer to preserve their fresh taste. These sound really good! 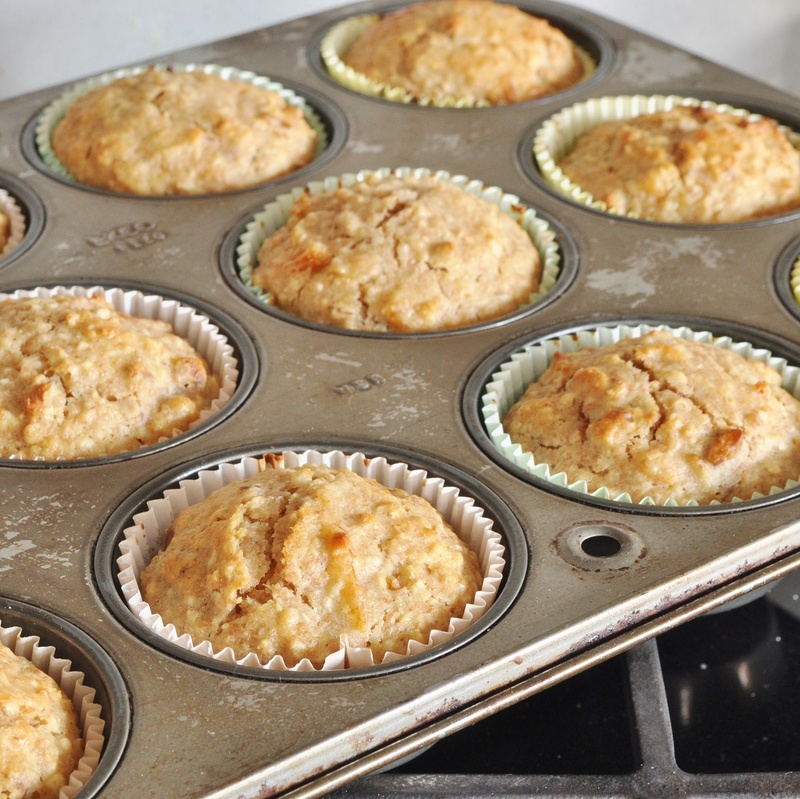 I love oats in a bake, and the marmalade sounds like it worked perfectly in the muffins. You’re not stretching things; I’m pretty flexible when it comes to Baking With Spirit, as long as there’s booze in there somewhere. I thought I wasn’t going to get any entries this month, so thanks for taking the time to enter! My pleasure, Janine! I am always left with almost-full bottles of spirits in my cabinet–I use them once in a recipe and then don’t know what to do with them, since I’m not a drinker. 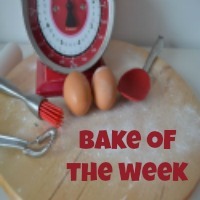 Baking with Spirit is a great way to get me thinking creatively about how to use them up. I look forward to linking up again in the future. Paddington would love these!! And so would I…… they look beautifully moist and perfectly orangey. The addition of the oats sound wonderful too! Of course, that’s what I should have called them: Paddington Muffins! I already did a recipe for “Paddington Buns” last year. You can follow this link for the recipe: https://thelassintheapron.com/2013/10/13/a-bun-called-paddington/. Thanks, Kirsty! They really were delicious . . . I think I’m going to have to make another batch, but I need to go buy myself another jar of whisky marmalade first! OMG I’m a muffin monster and had never thought about using jam or marmalade in lieu of fruit – your ma is a genius! Thanks for sharing with Tea Time Treats, I’d be very happy to find one of these in my lunch box! Thank you, Janie; I think she is, too! I hope they are! After all, I’m supposed to be dieting, too. With more emphasis on the “supposed to” than the actual “dieting”, I’m afraid. mmm I’m sure Paddington would not turn up his nose at one of these beautiful muffins. 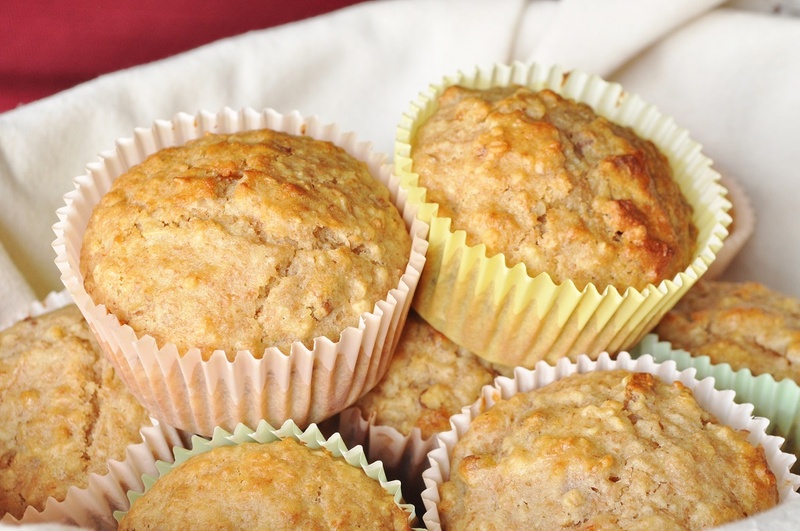 They would be great for breakfast as well as packed lunches, a really inspired recipe. Just as I would never turn my nose up at Paddington . . . I have tried several of your eggless recipes because I am allergic to eggs. your eggless cakes are superb. They have always been a big hit and specially I use almost everything organic so it is appreciated much widely. 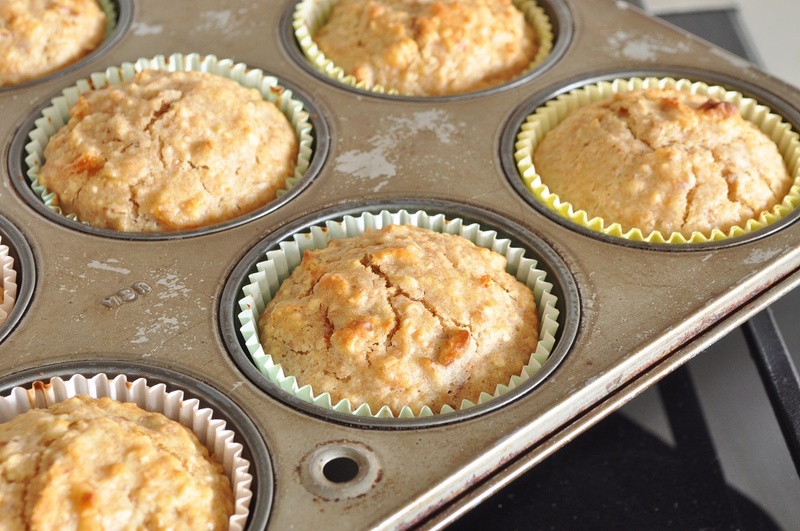 I am so tempted to make these muffins but certainly without eggs. Can I use something else as egg replacer in this or leave eggs altogether ? Any suggestions would be greatly appreciated. 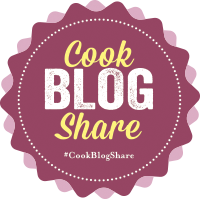 Look forward to hearing from you and dabbling my hands with new recipe. I’ve had good luck replacing eggs with a combination of extra water, baking powder, and vegetable oil. In this recipe, I’d suggest 2 tablespoons water, an extra tablespoon of oil, and an extra teaspoon of baking powder. Hope they turn out well! I’m glad to hear that you’ve had success with the eggless cake recipes.